Our research – and our researchers – have revolutionized IVF treatment especially day 5 – Blastocyst Culture Treatment. MMCH has a strong and long-standing commitment in supporting research with regard to Assisted Reproduction. Thanks to these efforts, MMCH is able to make valuable contributions in significantly improving the success opportunities of Assisted Reproduction Techniques (ART), ultimately resulting In MMCH having one of the highest IVF pregnancy rates worldwide. The development and refinement of the Day 5 Blastocyst Transfer Technology, Laser Assisted Hatching as clinical research works and the establishment of highly skilled techniques that allow stem cell extraction and growth along with CHG and IIS, Bangalore, India. Culturing the Blastocyst further beyond a week to reach Embryonic Stem Cells which yield totipotent cells for further separate cell line culture like cardiac cells, bone marrow cells, epidermal cells etc, for tissue transplantation treatment. Vitrification is a novel way of preserving oocytes and blastocysts safely without much alteration in the cell integrity with better implantation rates after thawing. 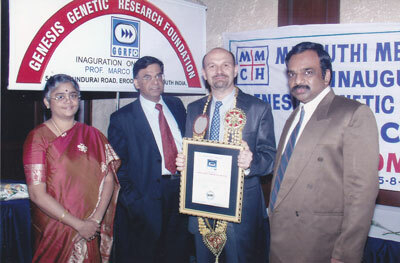 Genesis Genetic Research Foundation incepted in 2004 in the presence of MARCO FILICORI, leading IVF scientist of USA.